Err dear...I think there's going to be a naked lady dancing on the balcony! Hah! The title caught your attention, didn't it? Well, the 'naked lady' in question here is Lycoris sanguinea; various species of Lycoris are commonly known as naked lady, surprise lily, hurricane lily or magic lily. This bulb is from Diana of KBB. 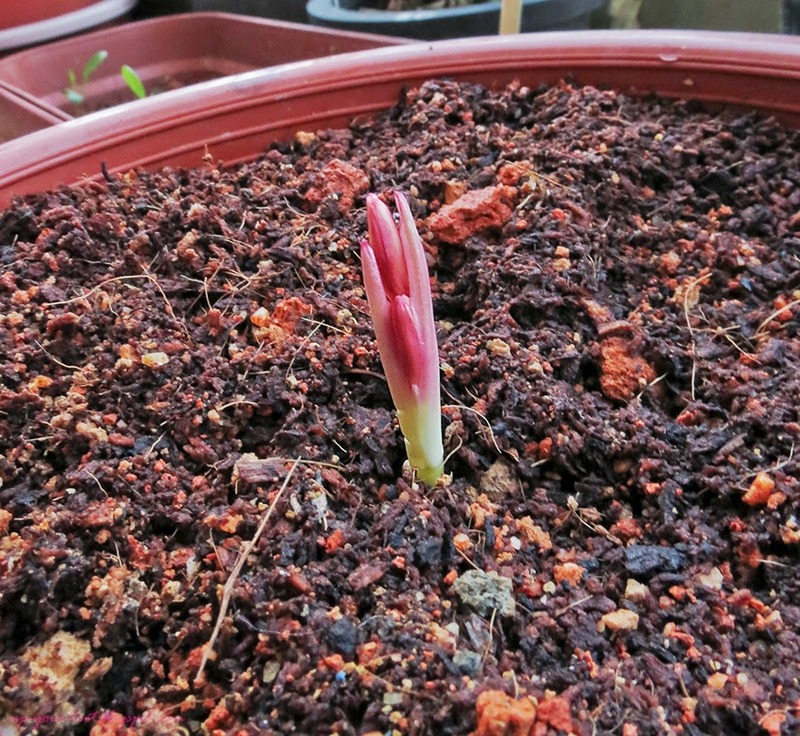 Having just planted it, I was expecting it to put forth leaves since Lycoris are known to dislike disturbance and will sulk and not flower. However, there are also some people who reported that the bulbs do flower in the same year they are put in. So perhaps this was a lucky bulb. Another amazing thing I learned from this plant is the fast rate of growth of the flower stalk. 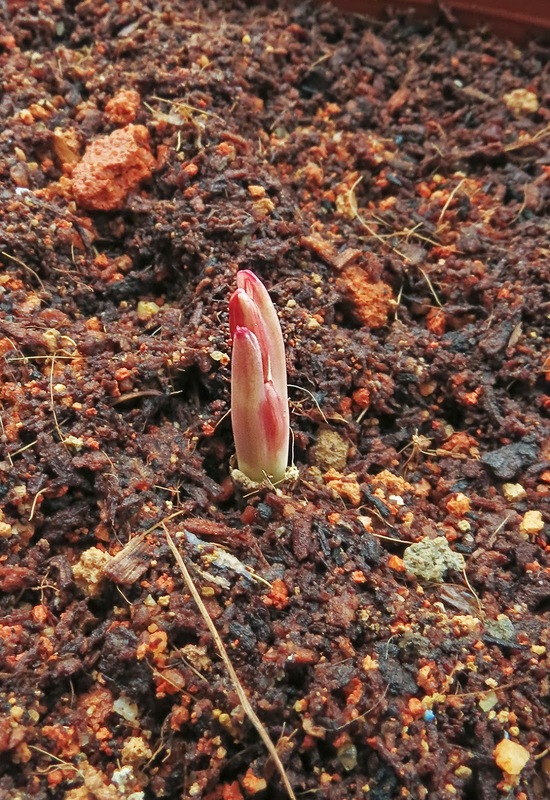 No wonder they are also called surprise lilies. 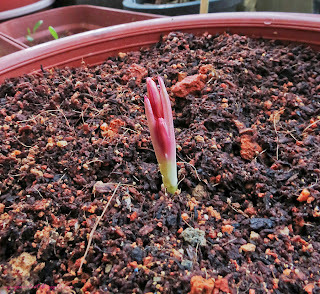 On the afternoon of 24th, a red-tipped white spear could be seen. 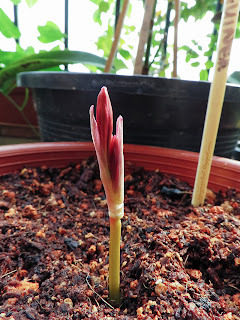 The next day on the 25th, the whitish-red spear begins to appear like a 'pregnant lady' trying to conceal the buds inside. 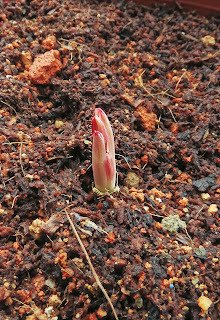 1pm 24th Aug: The tip showing above the soil - the reddish top is what got me wondering if it is a leaf tip or something else. 4pm 25th Aug: Looks like there's something inside the two 'flaps'. The flaps appears to be the involucral sheath that isn't covering the buds properly. The tip had elongated 1cm in a day! Around 8.10am today (the 26th - not even a full day from the 25th), the 'pole' for the naked lady to dance on can be seen i.e. the base where the umbel joins to the stalk (with the junction of the involucral sheath). 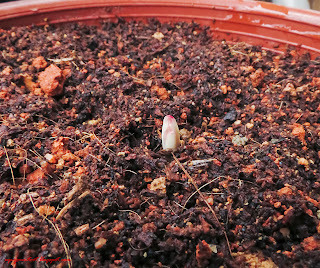 8am 26th Aug: Not even in one day, the stalk grew another 0.75 cm! The buds can be clearly seen peeking from the sheath and the junction of the sheath to the flower stalk can be seen (just above soil level). Q: What should I do with the naked lady in the garden? A: For goodness sake, put some clothes on her and get her in before the neighbour sees her! The buds peeking from the sheath on the 27th of Aug. The stalk had grown quite a bit (compared to previous picture) with the sheath junction almost 2 cm from soil level when it was just slightly above soil level the previous day. Kudup bunga dah mula 'selak kain' dalam proses membuat persembahan Naked Lady. Kawan-kawan KBB lain yang tanam Lycoris sanguinea berbunga juga ke? Takut sangat tangkai bunga ni patah akibat angin kencang. Can't wait to see the full bloom. I takut angin kencang kat sini je, takut patah. Kalau dah bloom, saya postkan gambarnya nanti. Naked lady buat persembahan on merdeka day I wonder. Tak sempat kot. Masih tiga inci dari aras tanah.